Rarely in our lifetimes has there been more controversy about the state of our First Amendment freedoms. It is critically important for our nation to have serious discussions about the threats and opportunities we face in maintaining and trying to enhance our democracy. 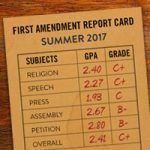 The Freedom Forum Institute, the nation’s pre-eminent organization that explains, promotes and defends the five freedoms of the First Amendment, launched a quarterly “report card” in the Spring of 2017 to evaluate the state of each of the five freedoms of the First Amendment. 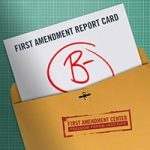 Our report card seeks to go beyond often partisan ad hoc observations to provide a credible and systematic evaluation of freedom based on grades provided by a diverse set of some of the nation’s leading constitutional scholars and observers. 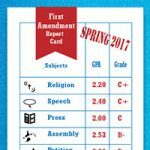 Our grading panel consists of 15 First Amendment experts— academics, lawyers, journalists and activists — from across the political spectrum. They have committed to providing updates of their opinions every quarter, using a consistent methodology. 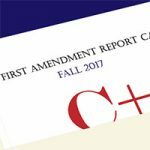 We believe that such a regular report will provide an important service by generating informed conversations of the kind envisioned by the drafters of the First Amendment. The grading was performed by 15 insightful panelists from across the political spectrum. These panelists have committed to providing quarterly updates of their grades for at least one year. We recommended that panelists start with national/federal-level considerations, but encouraged them to take note of state actions as indicators or precedents. 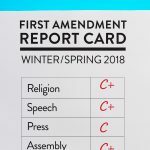 Panelists were advised that this first report card would set the baseline for First Amendment grades, in order to allow us to effectively track future shifts and changes to the state of First Amendment freedoms. For this reason, we instructed our panelists to base their evaluations on more than just the actions taken by the Trump administration during its first 100 days. We also asked them to consider pre-existing conditions (such as laws that pre-date the Trump administration), and issues the Trump administration does not directly control (such as speech on college campuses, or state-level restrictions on protests).